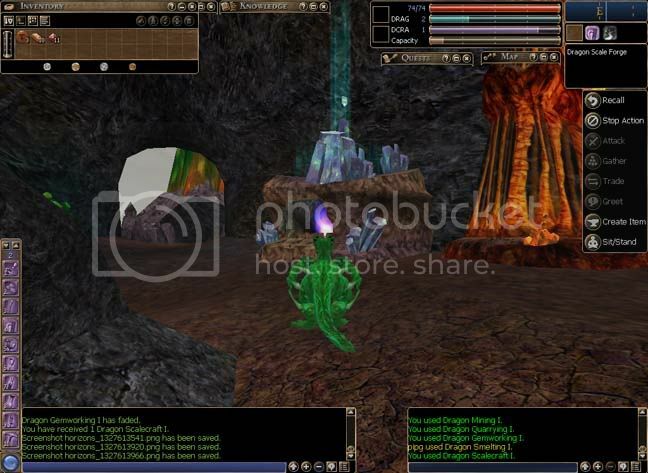 you have crafted your metal ore into bars and your gems into cut garnets. 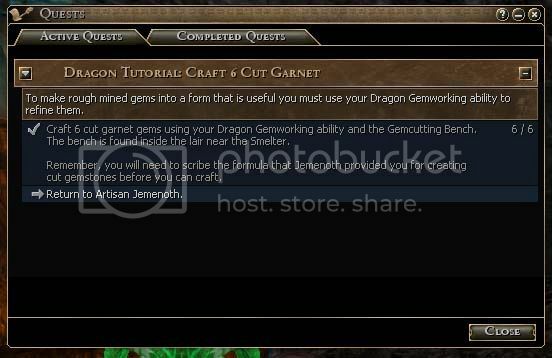 jemenoth now instructs you to create your first weapon - a dragon claw. as usual, check your journal for specifics. 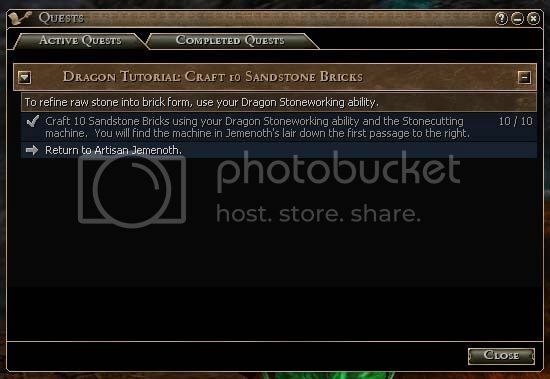 enable your dragon scalecraft ability, head over the bridge to the craft cave, and turn right. you will see the scaleforge. 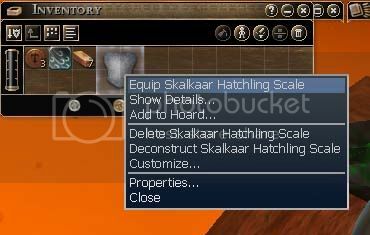 a scale forge is a workstation exclusive to dragons - bipeds cannot use it and have no real need to, altho it would be nice to make scales and claws for newbies. 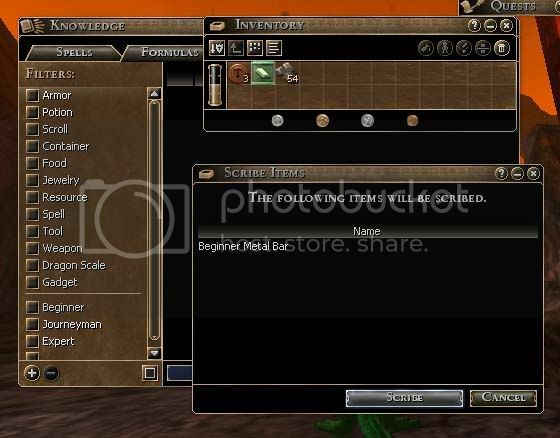 once you have created the item, check your inventory and journal, and return to jemenoth. 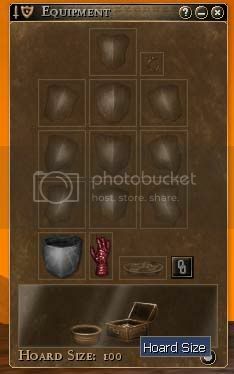 before you set off on your next quest for the dragon crafter, you might want to equip your claw.  not that you will need it, but hey, you just made it, why not? it's pretty swank, after all! 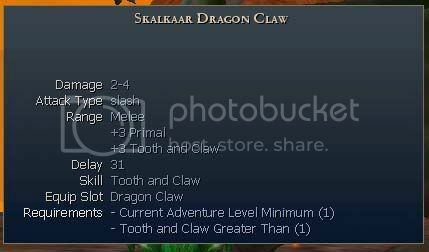 so, if you have closed your inventory window, open it and highlight the claw. 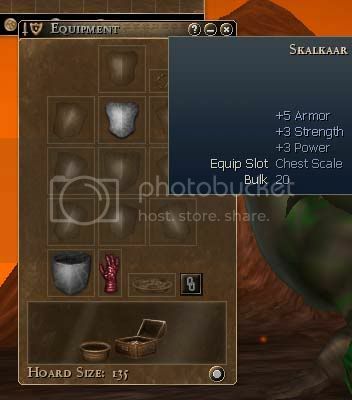 right click and choose the equip option. 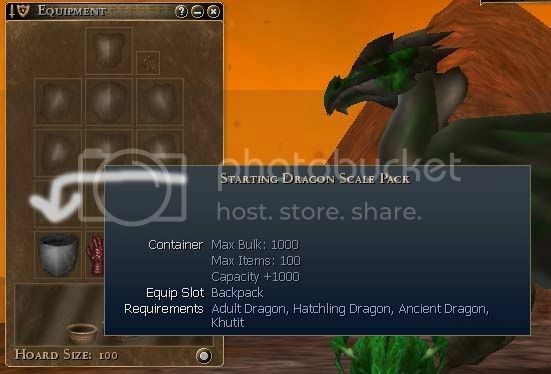 open your equipment tab and notice that your claw is now equipped, along with your dragon pack. 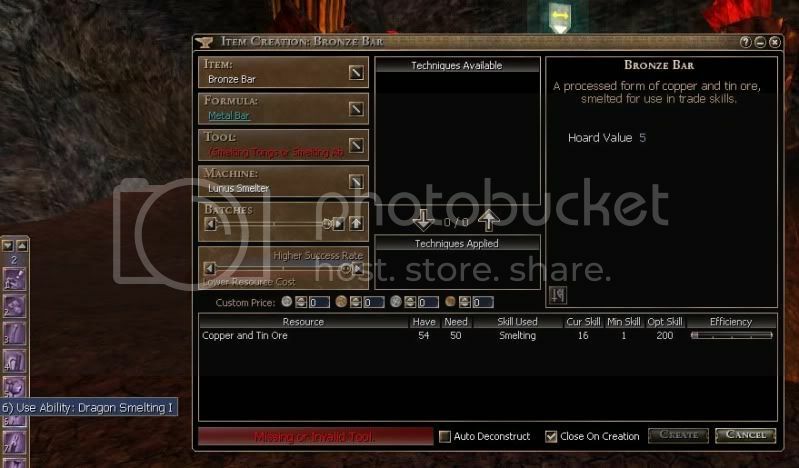 notice, at the bottom of the screen, you see your current hoard level (which i believe i have told you about already). you will also notice other open slots, one of which you will fill soon enough. your new quest is to mine some garnets. pretty much the same process as doing ore, so no big surprises. 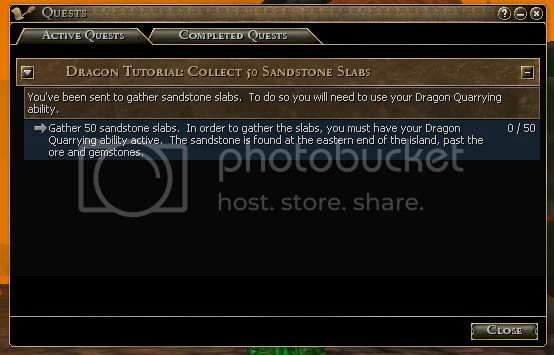 first step is to find the gem field, between the ore and the sandstone fields. 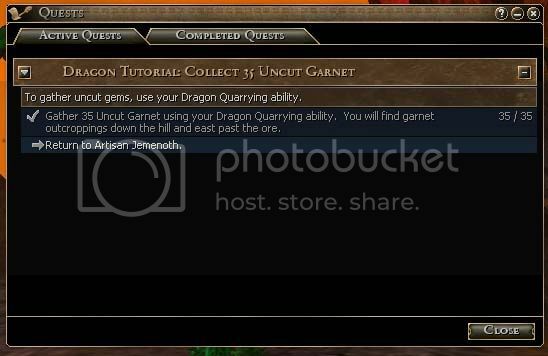 select a garnet node, equip your dragon quarrying ability, and hack away until you have the 35 pieces of uncut garnet you need for your current quest. 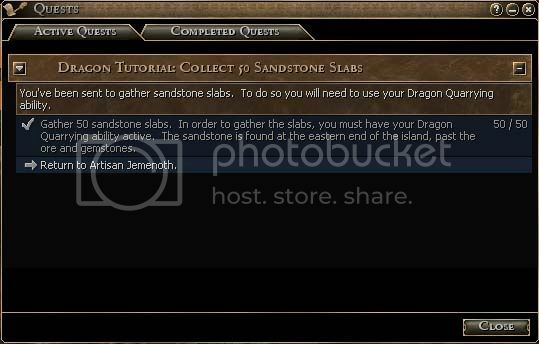 as with the metal ore, once you have what you need for the current quest, your journal will update with instructions to return to jemenoth. 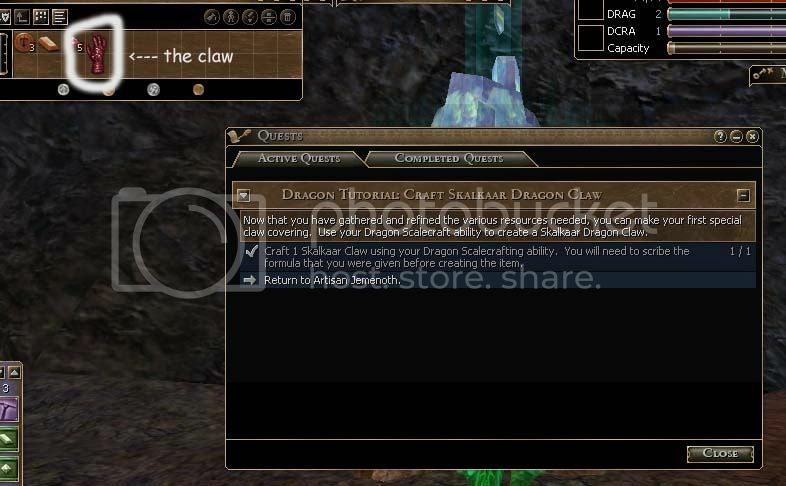 speaking to the dragon crafter will get you a new form to scribe and a new task to complete. 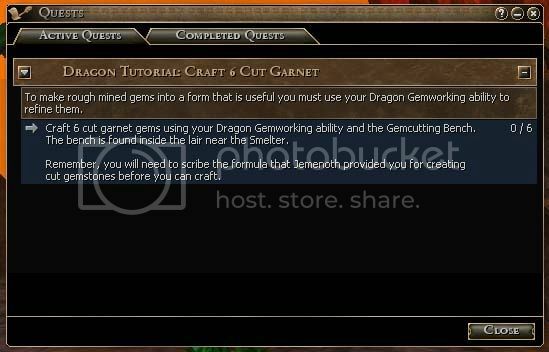 scribe the gem form as required and check your quest journal for specifics. of course, your journal will update, advising you to return to jemenoth for further instructions. and jemenoth will have you next create your first piece of equipment!! no spoilers, you will just have to come back soon to find out! it's been a while, so you may not remember that after you brought back the copper and tin ore, jemenoth asked you to make some bronze bars. 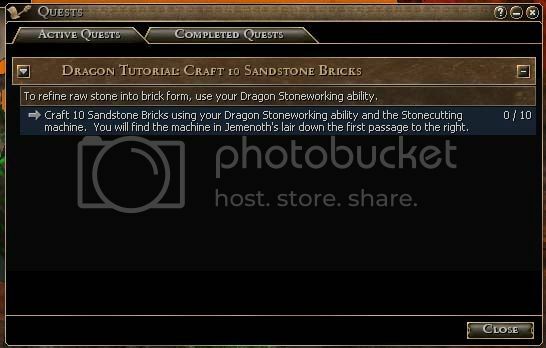 after you scribe the form, you need to use a smelter and your dragon smelting ability to make them. first thing to do, go to the craft cave and find the smelter - quite an easy task! if you are speaking to jemenoth, you are standing next to the bridge to the floating craft island. 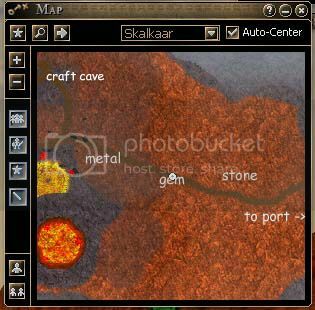 go over the bridge and into the cave entrance, and immediately to your left will be the smelter. to your right will be the scale forge, which you will be using a bit later. 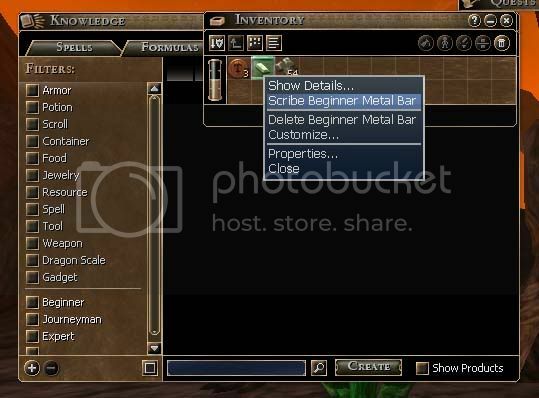 once in front of the smelter, open your knowledge book and choose resources, then metal. 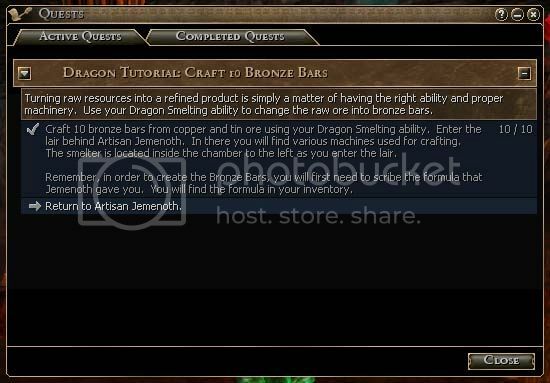 you want to make bronze bars, so choose that option. 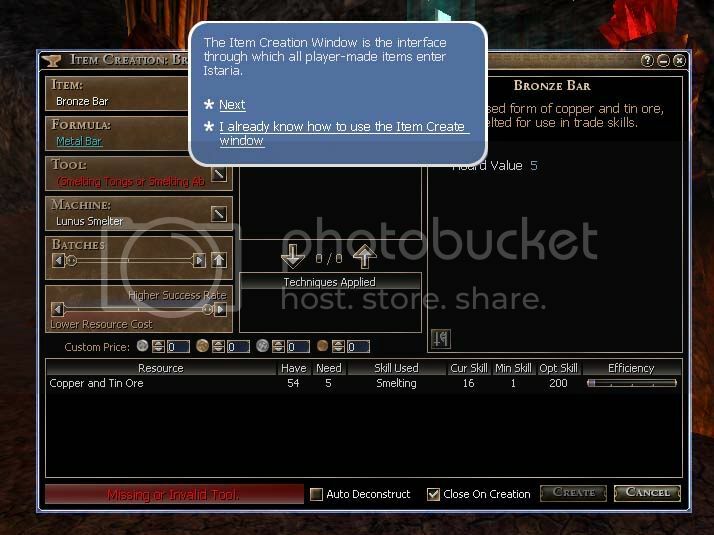 the item create screen will come up. 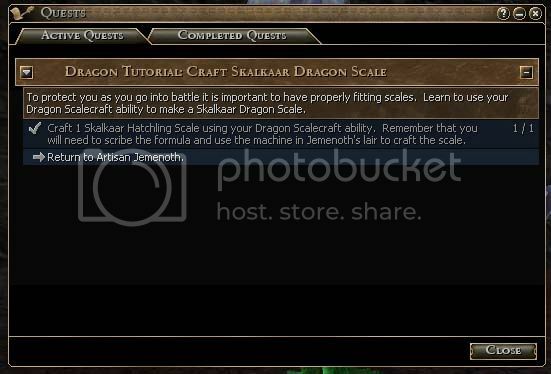 if it is the first time you are creating something (and if you are on skalkaar island, it is assumed, often incorretly, that it is), the tutorial will pop up. use it if you need to, of course. 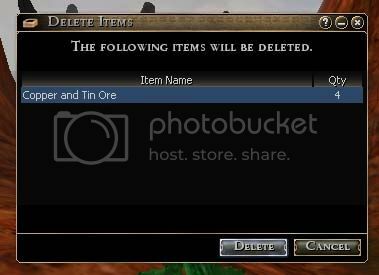 otherwise, choose your production amount and equip your smelting ability (one hopes you have all your abilities hotkeyed, of course), then click the 'create' button. 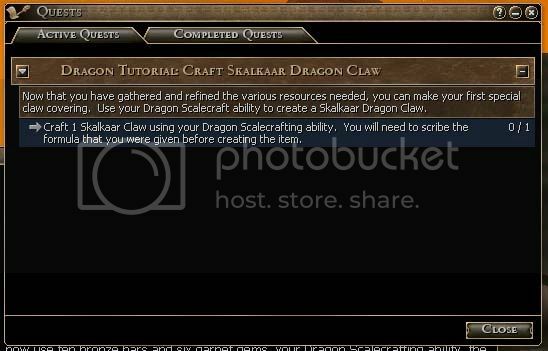 once you have made the required material, your quest journal will update with instruction to return to the dragon crafter. so go back thru the entrance and over the bridge. speak again to jemenoth, so she can send you on the next quest. which we will, of course, discuss next time! see ya then! 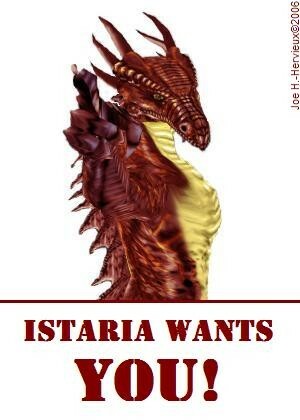 istaria has a lot of stuff to scribe into your book of knowledge - spells, techniques and forms of all tiers and levels. while you may suffer from an overabundance of choice in that regard, fortunately you only have one way to get them all into your book - you scribe them. this brings up your knowledge book. it contains three tabs - spells, formulas, and techniques. you can sort (or filter) each of these specifically (for instance, by type and tier [class] for the shown technique tab). 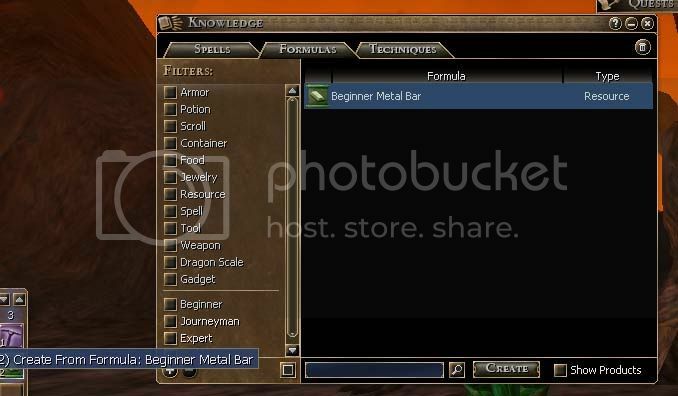 for jemenoth's quest, we are to scribe our first crafting formula - to create metal bars. 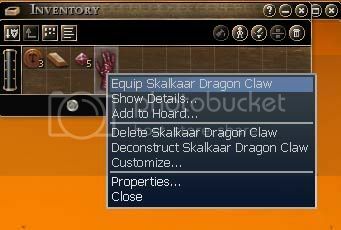 so open the formula tab then go to inventory. 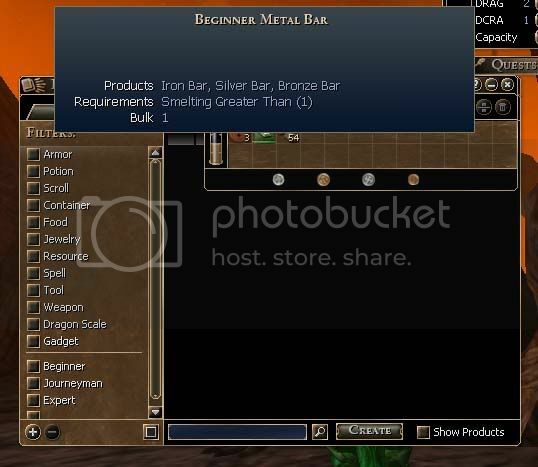 there you should see the icon for the metal bar form (may be hard to see, but it is the green icon under the description). as you may have already guessed, if you have been reading this blog for a while, anyway - to scribe the form, you right click on the icon and choose 'scribe xxxxxx' (in this case, beginner metal bar). you will be asked to confirm what you want scribed. it is useful to keep in mind that you can multiscribe (as well as multidelete and a couple other tasks) by choosing more than one form to scribe - you will be asked to confirm them all in the process. 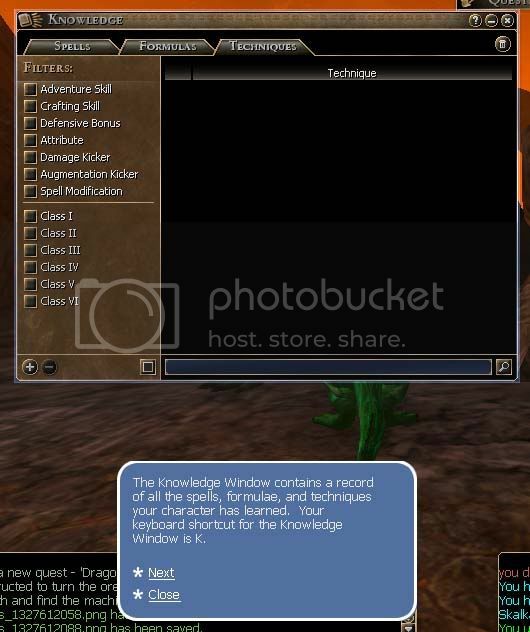 once you have confirmed, your scribed form (spells, technique) will appear on the appropriate tab in your knowledge book. 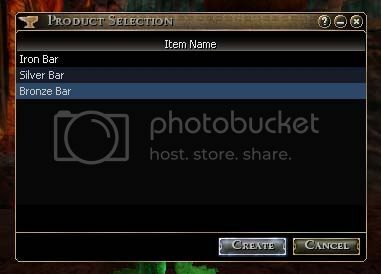 you can now access it to create the desired item/effect. 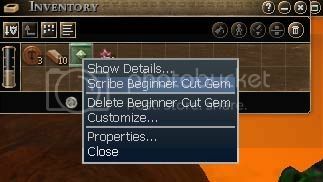 you can also hotkey forms and spells, handy if you are level grinding or have fave battle spells. for the next post, we will quickly cover some old ground by creating the bronze bars needed for the craft dragon's quest. see ya soon! !